The day Clay receives the Hannah Bakes tapes is not like any day before in his life. And no of the days after that will be the same. Clay has had a crush of Hannah for years. But because of this shyness his chances with Hannah are on the past now. And there is only one reason for that. Hannah killed herself. But before her suicide she recorded 13 tapes explaining why she took her life away. The tapes are sent to the people who made the list. When Clay gets the tapes and listens to the first tape, he gets to know that he is one reason why Hannah did what she did. The story is told through Hannah's tapes and Clay's thoughts. Having these two very different narrators gives a nice, interesting twist to the book. Hannah has been hurt and disappointed. When Clay receives the tapes he is hurt too. And scared. He cannot understand why he is on Hannah's tapes. 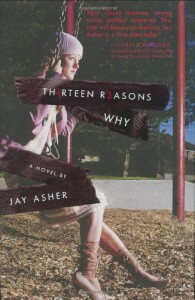 The style Jay Asher uses in this book builds suspense and you just have to keep reading and reading. Some events are foreshadowed which makes the reader want to know more about events which eventually are explained with more detail. Hannah's tapes are disturbing, but what I really like about them is the honesty. 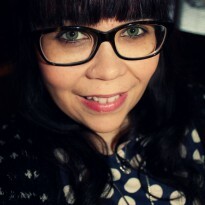 And as my Finnish teacher said; If a novel does not make you disturbed/fall in love/emotional etc. the writer has not really succeeded in his/her work. In that area, Asher has succeeded extremely well. I think "Thirteen Reasons Why" tells about very important, and in a way, taboo issue. I recommend "Thirteen Reasons Why" to readers of all age (but maybe not under 13 because of the issue and some disturbing images). I promire this book will stay in your mind for weeks after reading it!